Saturday, September. 22, 2018 at the Raymond E. Hartfield Performing Arts Center, 5800 McNeil Dr. in Austin. The performance begins at 3:00 p.m. The event is open to the public. Entrance fee is $1.00. Elementary students receive FREE admission. Students from Cedar Ridge, Round Rock, Stony Point high schools, C.D. Fulkes and Hernandez middle schools study and practice classical and folkloric dance techniques and perform together as Alma Mexicana Ballet Folklorico in traditional Mexican costumes. 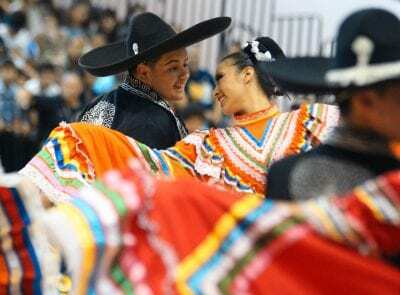 Ballet Folklorico is a collective term for traditional Mexican dances that emphasize regional culture with ballet characteristics – pointed toes, exaggerated movements and highly choreographed moves. The art of Ballet Folklorico blends elements from its indigenous, African and European heritage.